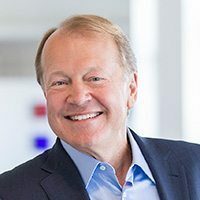 John Chambers, Executive Chairman of the Board, is a working chairman with key areas of responsibility that include: focusing on country digitization and building relationships with government and business leaders, shareholders, and board members. He is an advisor to CEO, Chuck Robbins, on the company’s strategy, digital transformation, security and strategic partnerships, among other areas. Chambers became President and CEO in 1995 and Chairman of the Board in 2006. He helped grow the company from $70 million when he joined Cisco in January 1991, to $1.2 billion when he assumed the role of CEO, to $47 billion in FY15. In 2006, Chambers was named Chairman of the Board, in addition to his CEO role. He served as Chairman and CEO from 2006 – 2015. Chambers has received numerous awards for his leadership over his past 20 years at the helm of Cisco, including being named the number two “Best-Performing CEOs in the World” in 2015 from Harvard Business Review, 2012 Bower Award for Business Leadership from the Franklin Institute, Time Magazine’s “100 Most Influential People,” one of Barron’s’ “World’s Best CEOs,” the “Best Boss in America” by 20/20, one of BusinessWeek’s “Top 25 Executives Worldwide,” “CEO of the Year” by Chief Executive Magazine, the Business Council’s “Award for Corporate Leadership,” and “Best Investor Relations by a CEO” from Investor Relations Magazine three times. During his tenure as CEO, Cisco has been named to Fortune’s “America’s Most Admired Company” list since 1999 ranking number one in the Network Communications category eight times, BusinessWeek’s “Top 50 Performers” list six times, Forbes’ “Leading Companies in the World,” and is one of the top 10 places to work in the United States, China, Germany, France, India, UK, Australia, Singapore, and several other countries. In addition, Chambers has been widely recognized for his and Cisco’s philanthropic leadership, including receiving the U.S. State Department’s top corporate social responsibility award (ACE) twice, from both Secretary of State Hillary Clinton in 2010 and former Secretary of State Condoleezza Rice in 2005. He also received the first-ever Clinton Global Citizen Award from former U.S. President Bill Clinton, and has been awarded the Woodrow Wilson Award for Corporate Citizenship, and the prestigious Excellence in Corporate Philanthropy Award, an award given by CEOs to their CEO peers. Chambers takes an active role in corporate social responsibility initiatives worldwide. Recent partnerships include working with the Palestinian ICT sector growing ICT from .8% to over 5% of GDP in 2 years; Connecting Sichuan, an effort to help rebuild healthcare and education models in the Sichuan, China region impacted by the May 2008 earthquake. Chambers also cosponsored the Jordan Education Initiative, which Cisco has worked on in partnership with His Majesty King Abdullah II of Jordan and the World Economic Forum. Additionally, in late 2006, Chambers co-led a delegation of U.S. business leaders, in partnership with the U.S. State Department, to form the Partnership for Lebanon, helping provide critically needed resources for ongoing reconstruction in Lebanon. Chambers has also spearheaded several other education initiatives, including the 21st Century Schools initiative, to improve education and opportunity for children in the Gulf Coast Region affected by Hurricane Katrina. He has served two American presidents, most recently as Vice Chairman of the President George W. Bush National Infrastructure Advisory Council (NIAC), where he provided industry experience and leadership to help protect the United States’ critical infrastructure. He also served on President George W. Bush’s Transition Team and Education Committee, and on President Bill Clinton’s Trade Policy Committee. Chambers joined Cisco in 1991 as Senior Vice President, Worldwide Sales and Operations. Prior to joining Cisco, he spent eight years at Wang Laboratories (1982-1990) and six years with IBM (1976- 1982). He holds a Bachelor of Science / Bachelor of Arts degree in business and a law degree from West Virginia University and a master of business administration degree in finance and management from Indiana University.